Progressive Charlestown: When will it end? As the heads of Veterans Affairs and the Environmental Protection Agency face intense scrutiny over taxpayer-funded travel decisions, a new analysis by the Washington Post reveals that more than 40 percent of President Donald Trump's initial cabinet-level selections have faced ethical or other controversies. Aaron Blake at the Post found that nine out of the 22 people whom the president initially chosen for cabinet-level positions have faced some degree of public criticism for their actions, highlighting "what has been a pretty rocky first year-plus for the Trump cabinet" and demonstrating how Trump has failed to deliver on his oft-repeated campaign promise to "drain the swamp." Veterans Affairs Secretary David Shulkin: A report by his agency's inspector general found that Shulkin and top aides edited an email and made false statements "to create a pretext for taxpayers to cover expenses for the secretary's wife on a 10-day trip to Europe last summer," according to another Post story. Environmental Protection Agency Administrator Scott Pruitt: As Common Dreams reported, Pruitt is in hot water for "taking expensive first class flights and staying in luxury hotels on the taxpayer's dime...to avoid uncomfortable interactions with people who are mad at him for trying to destroy the planet." Former Health and Human Services Secretary Tom Price: He resigned in September amid a growing scandal that invovled using tax dollars to travel throughout the country in pricey private jets. Interior Secretary Ryan Zinke: As Price was submitting his resignation, Zinke was ridiculed for taking, according to Politico, "several flights on private or military aircraft, including a $12,000 charter plane to take him to events in his hometown in Montana," which subsequent reports revealed belonged to fossil fuel executives. 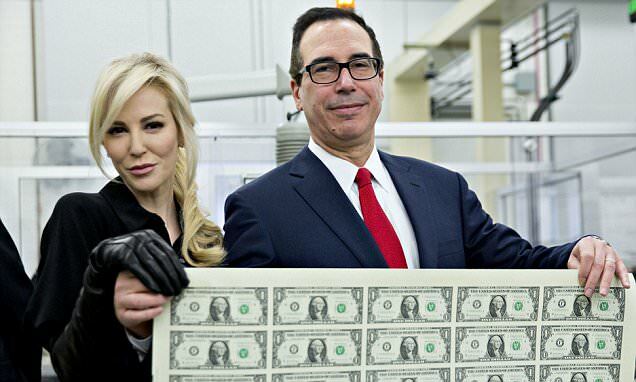 Treasury Secretary Steve Mnuchin: He not only requested a military jet to take him and his wife, Louise Linton, to Europe for their honeymoon, but also for a trip to Fort Knox to view the solar eclipse (after which Linton provoked outrage over a classist tirade she posted on social media alongside a photo of them disembarking from the aircraft). Chief of Staff John Kelly: Women's advocates and others have called for Kelly—who initially served as Trump's Homeland Security secretary—to resign amid criticism that he ignored and improperly handled allegations of domestic violence levied against former White House staff secretary Rob Porter, who resigned following a series of reports about the alleged abuse. Kelly reportedly instructed aides to lie and claim he took immediate action to address the allegations. Attorney General Jeff Sessions: The nation's top attorney had to recuse himself from the investigation into alleged election interference by Russians—and claims that members of the Trump campaign colluded with Russians and obstructed justice—after it was discovered that during his Senate confirmation hearing, Sessions failed to disclose his communication with Russian officials, potentially committing perjury. Labor secretary nominee Andrew Puzder: The fast food executive withdrew his nomination to lead the Labor Department amid charges that he had made "derisive public comments about his restaurants' employees and other low-wage workers" as well as "concerns about past employment of an undocumented housekeeper and later-recanted domestic violence accusations from an ex-wife." Housing and Urban Development Secretary Ben Carson: Despite warnings from the department attorneys, Carson let his son organize an agency "listening tour" in Baltimore last summer, which might have violated federal ethics ruled, according to documents obtained by the Post, because "local businessman Ben Carson Jr., and daughter-in-law were inviting people with whom they potentially had business dealings." "The repeated travel controversies, in particular, suggest the administration isn't running a particularly tight ethical ship or that there is a ton of overcompensation for Trump's promise to 'drain the swamp,'" Blake notes. "His cabinet picks are proving a particularly stark example of where that effort has come up short."